With Gator Paper you can now afford to have your own custom printed Wrapping Paper! We offer a Wrapping Paper that stands up to all brands. If you’re looking for the perfect Wrapping Paper that serves as the all around go-to for gift Wrapping Paper, Christmas Wrapping Paper, or birthday Wrapping Paper, it’s durable and will stand the test of wear and tear for any type of use. No matter if it’s a small order of Wrapping Paper rolls or a large bulk order to save on your purchase, our white or brown Wrapping Paper is a great way to personalize your greeting. Talk about getting the most brand exposure possible with your customers; now that’s something to wrap your head around! 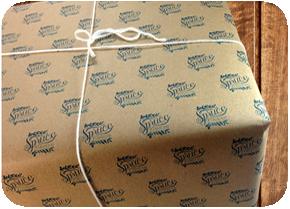 Customers love when a purchase is special enough to be wrapped in custom wrapping paper. It shows them you stand by your product and want the world to know about it. Our commercial grade Wrapping Paper is available in kraft brown and white. With a three roll minimum, this branded paper is sure to turn heads and give your company an edge over the competition. Let us help your business reach new heights with our line of custom printed Wrapping Paper. Custom printed Wrapping Paper from Gator Paper is sure to help put your mark on the retail industry! What is the minimum order for custom printed Wrapping Paper? The minimum order requirement for custom printed Wrapping Paper rolls is 3. Roll lengths vary from 600’ – 1,000’ per roll. Our ability to offer small order minimums eliminates your need for additional storage room. How long will my custom Wrapping Paper order take to print? 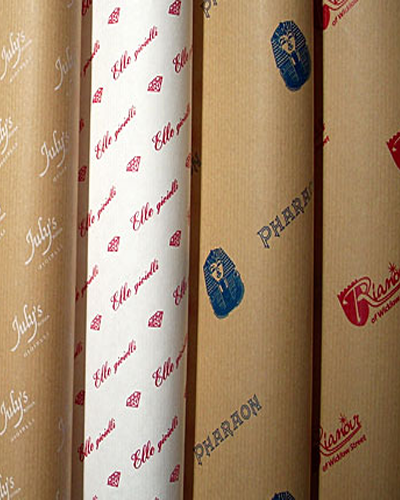 Six to eight weeks is the standard production time for all custom printed Wrapping Paper orders. Rush orders are available for an additional fee when the production schedule allows. What are your Wrapping Paper printing capabilities? Three color spot PMS printing and full coverage printing available . We can match any PMS color on the chart. What kind of artwork is required for Wrapping Paper? All artwork submitted to Gator Paper must be a Vector art file. Adobe Illustrator, .EPS and high resolution PDF files are preferred. If the line artwork is simple enough, sometimes a JPEG file will work. Bitmap images are not good enough quality for proof or plate making and are not accepted. Need a price quote on Custom Printed Wrapping Paper? Contact us today! In need of a lightweight sheet to complete your retail packaging design? Check out our custom printed Tissue Paper! It’s the perfect addition to any retail packaging project!